It is frightening to think about how much time has passed since London hosted the most recent Olympic Games. London 2012 became such a big part of our collective lives before and during the event, yet it is two years back in history now and the buzz is building about Rio 2016. This is not a time for doom and gloom though – London remains one of the most active cities on the planet and continues to host world class sporting events on a regular basis. The London Triathlon is one of these events and as competitors go about their triathlon training in London we look both back at the part this sport played in that glorious summer of 2012. Had London hosted the Olympic Games prior to 2000 our capital city wouldn’t have seen any Olympic triathlon action. The sport made its Olympic debut as recently as the Sydney Games of that year. Against the dramatic backdrop of the Sydney Opera House, 48 female triathletes swam, cycled and ran – with 52 men doing the same the following day. The first ever Olympic triathlon gold medallists were Switzerland’s Brigitte McMahon (her team-mate Magali Messmer took bronze) and Canada’s Simon Whitfield. 2004 saw the Games return to their birthplace – Greece, specifically its capital city Athens. The number of triathletes competing at the Vouliagmeni Olympic Centre was similar to that witnessed four years earlier in Sydney. The honour of women’s gold medal remained in Europe, but this time going to Switzerland’s neighbour Austria and Kate Allen. The Swiss took the men’s bronze medal, courtesy of Sven Riederer, but it was two New Zealand chaps who won gold and silver – Hamish Carter and Bevan Docherty respectively. 110 triathletes from 37 nations took part in the Beijing 2008 Olympic Games – doing their thing at the Ming Tomb Reservoir. In the women’s event Australian Emma Snowsill won gold, with her compatriot Emma Moffat taking bronze. And in the men’s event we saw some returning names on the medal table – Bevan Docherty with bronze and Simon Whitfield with silver. But 2008 was to be the year of the first European male gold medallist for triathlon – Jan Frodeno of Germany took the honour. 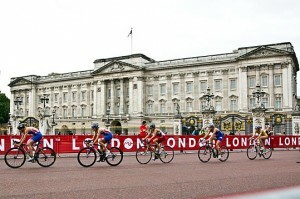 And so we come to London, where the number of competing athletes and nations for triathlon matched Beijing 2008. The predecessors’ triathlon venues were of course stunning, but could any of them have matched the iconic setting for London’s Olympic triathlon? The 1.5km swim took place in the Serpentine, where a specially constructed pontoon was installed, in Hyde Park. 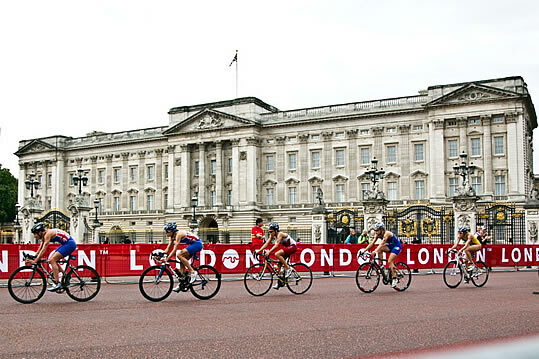 The triathletes then saddled up and cycled 43km – leaving Hyde Park via Queen Mother’s Gate and travelling through Wellington Arch, down Constitution Hill and on to Birdcage Walk in front of Buckingham Palace. The final stage was back in Hyde Park with a 10km run in the form of four laps around the Serpentine. The women’s event took place on 4th August and was won by Nicola Spirig of Switzerland, with Sweden’s Lisa Nordén and Australia’s Erin Densham as runners up. But in the men’s event on 7th August it was to be one of the many proud London 2012 moments for Great Britain – Yorkshiremen brothers Alistair and Jonathan Brownlee took the gold and bronze medals respectively, with Spain’s Javier Gómez Noya completing the line up on the podium. The variety of nations represented on the triathlon podiums over the years shows that no one country dominates the sport, and the success of the Brownlee brothers says that it is something where home grown champions for the UK are a possibility. Triathletes preparing to swim, run and cycle in London at this year’s London Triathlon should take these facts as an inspiration and who knows – some of them could be Olympic triathletes of the future.